Photo by Lisa Klink on Flickr. United Hollywood fills in the details on what went down in the latest round of talks with the media moguls and a Teamster lays out some numbers to consider. Mark Verheiden posts an email from the creator of Without a Trace, Hank Steinberg. If what Steinberg suggests is true, this strike will go on for weeks. Also check out a recent strike news round up from Maureen Ryan. This is actually a great idea from livejournalist wisteria: if a BSG fan wins the Pencils2Moguls throwdown, how about letting them choose either a personal phone call from their favorite actor - or a personalized voicemail outgoing message recorded by that actor...in character, or out. More of the BSG cast has stepped up to encourage fandom to win this multi-fandom "throwdown" while also sending a truckload of pencils to Big Media to show them what we think of their behavior during this strike. Mary McDonnell, Tricia Helfer, Michael Hogan, Jamie Bamber, and Michael Trucco have all agreed to make a personal phone call to fans who win the raffles in their names. The way this will work is simple: when you go to the Pencils site, the first box you’ll see asks you the name of the show you wish to support. Type in “Battlestar Galactica” and then the name of one of these actors, and your name will then be automatically entered into a raffle, with the winner in each category receiving a personal phone call from that actor. You can certainly buy boxes of pencils for more than one actor, but each box can only be assigned one name. Also, in the event that the winner of the Aaron Douglas raffle is not in Vancouver, or cannot travel there (on their own dime), Aaron has offered to make a personal phone call to that fan and send a piece of signed memorabilia. This is a really great and generous offer from our cast members and it could be a once in a life-time chance to get to talk to them, so take advantage of the opportunity and help us drown the moguls in pencils! So this is how it works: go to the Pencils2Moguls widget on the right side column of this blog, and type in "Battlestar Galactica (actor name)" and then order the pencils. If BSG fandom wins the throwdown, the winner will get a call from the actor they chose. If an Aaron fan wins, and they can fly to Vancouver, they get to go to a hockey game with The Chief. Eclipse: How do you feel about the rumor that Sci-Fi is going to split the final season into two seasons? RM: It is under consideration. The writers’ strike is complicating everything. Even before the strike, we didn’t know. There will definitely be a break between the first half and the second half. The season was designed with a midseason cliffhanger. It doesn’t feel like it’s real, more like a stunt to “artificially” stretch the show for another year and charge loyal fans for extra DVDs. 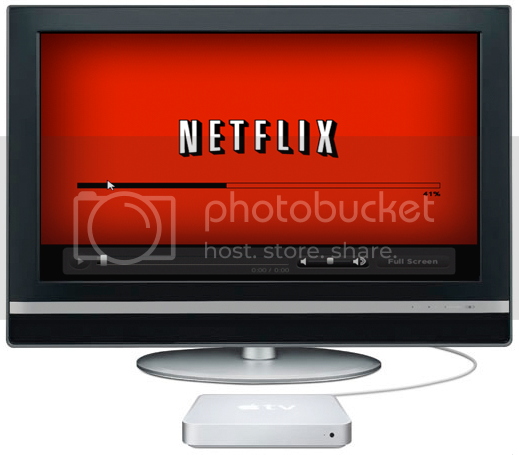 It is a network decision – the DVDs are the concern of the studio. It is not the same people making those decisions. The network doesn’t care about the DVD. The studio doesn’t have any say over the network schedule. The season is up to Sci Fi and how they are going to program their channel. Do they have other shows up and running? Do they want BSG to run into the summer? It’s all about scheduling issues with Sci Fi. Do you think you’ll pull a Joss Whedon and continue BSG in Comic Book form? I don’t have any plans to do that. The plan is to end the show definitively. I don’t know if there’s another story beyond that that I want to tell in comic book form. What’s next for you after BSG? I have a series in development at NBC. I am supervising another series at Fox Broadcasting. I have some features in development that I’m writing – the sequel to iRobot and a version of The Thing for Universal. It’s connected to the 1982 film. According to Aaron Douglas fans, if a BSG fan wins the Pencils2Moguls contest between fandoms, and they cannot make it personally to Vancouver, Douglas will be calling that person and sending them some autographed goodies. After four days of bargaining with the AMPTP, we are writing to let you know that, though we are still at the table, the press blackout has been lifted. For streaming television episodes, the companies proposed a residual structure of a single fixed payment of less than $250 for a year's reuse of an hour-long program (compared to over $20,000 payable for a network rerun). For theatrical product they are offering no residuals whatsoever for streaming. In the meantime, we felt it was essential to update you accurately on where negotiations stand. On Wednesday we presented a comprehensive economic justification for our proposals. Our entire package would cost this industry $151 million over three years. That's a little over a 3% increase in writer earnings each year, while company revenues are projected to grow at a rate of 10%. We are falling behind. For more information about the Writers Guild of America, West, please visit www.wga.org. For more information about the Writers Guild of America, East, please visit: www.wgaeast.org. The Writers Guild of America, West (WGAW) and the Writers Guild of America, East (WGAE) represent writers in the motion picture, broadcast, cable, and new media industries in both entertainment and news. The unions conduct numerous programs, seminars, and events throughout the world on issues of interest to, and on behalf of, writers. See also this from United Hollywood. Deadline Hollywood Daily reports that it looks like progress is being made on the talks between the WGA and AMPTP, however the WGA has asked for time to study the newest AMPTP proposal, and so talks are on hold for now until December 4th. Don't get your hopes up, but keep checking DHD for the latest. Two very engrossing (and depressing) new posts on the Writers Guild strike: this one is about the less-publicized, and highly dangerous, anti-union practices involving reality TV. And this one is written by a lawyer in digital media, entertainment and technology law – discussing just how much the AMPTP are so NOT GETTING THIS in a basic way. GDG of the Battlestar Blog has organized a rewatch of BSG starting tonight with the miniseries. So fire up your DVD player and join in. The rewatch schedule works out nicely to about the time season 4 should start to air in March as well as when the season 3 DVDs should be out. Well it looks like Ron Moore has replied to the challenge from the SMALLVILLE showrunners. How would you like to go to a hockey game with the Chief? That's right, our own Aaron Douglas will take one fan to a Canucks hockey game, along with another buddy of his up in Vancouver. And how can you score this treat? Simple. By going to Pencils2MediaMoguls.com and buying as many boxes of pencils as you can. On the first page (which is a subset of United Hollywood) you'll see a place to identify which show you're supporting. Type in "BSG Aaron Douglas" and we'll enter your name into a raffle, with the lucky winner getting to attend the hockey game with Aaron. In case you haven't heard, the Pencils Campaign is designed to send a huge amount of pencils to the major studios as a symbol of fan support for the strike. More information can be found on their website. Look for other offers from other members of the Galactica cast in the near future -- no idea what the offers will be or how many there may be. I'll keep you informed. An update on that BIONIC WOMAN rumor Logan posted below: according to Katee Sackhoff, it's not true. This has nothing to do with whether or not the show is coming back after the strike, however. C'mon guys - you can't just sit there while the SMALLVILLE showrunners issue a challenge like this? Your fandom is standing here waiting. Tapping its collective foot. So, Miles and I were sitting around the other day (which is what writers do when they can't write and their picketing shift if over) wondering what we can do to kick this Pencils2Moguls campaign up a notch. Don't get me wrong, we are stoked by the response so far, but we felt there must be something we can do to really light a fire under it going into the holidays. Then the answer hit us -- the greatest criminal mind of our time -- Lex Luthor. We will give the gift of Lex. Well, not really since he is, after all, a fictional character, but we do have Michael Rosenbaum, one of the best young actors of our time (in our humble opinion). We thought, why not offer a challenge to some of these other shows who have devoted fanbases (that's right Battlestar and Buffy I'm talking to you!) and see whose fans can really deliver the goods (in this case, pencils). For every box of environmentally friendly pencils you buy at Unitedhollywood.com, your name will be entered into an e-raffle. We will then pick a winner at random and they will receive at phone call from Michael Rosenbaum thanking them for their support of both the cause and the show. That is right, Lex Luthor will call you directly! Make sure you list SMALLVILLE as the show you are supporting when you click on the icon. So, Craig, please spread the word far and wide.....and thank you all for your continued support and good wishes. We are all in this together. 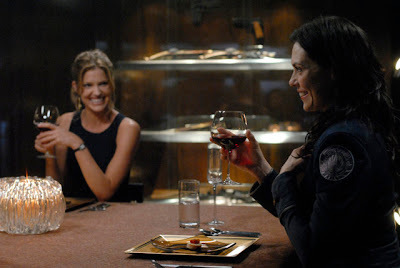 AfterEllen has an interview with RAZOR writer/producer Michael Taylor and actress Tricia Helfer. Eclipse Magazine and GIANT Mag have interviews with Jamie Bamber. The actors' trade magazine Back Stage talked to Katee Sackhoff. Slice of SciFi and PopCandy recently interviewed BSG writer Jane Espenson, who has also worked in the past on BUFFY THE VAMPIRE SLAYER, ANGEL, FIREFLY, ELLEN, and STAR TREK: DEEP SPACE NINE. CheapPop has an interview with BSG writer/producer David Weddle. Glitterati Gossip covered Tricia Helfer, Katee Sackhoff, Michael Trucco and their beloved hogs at this year’s Love Ride (see above photo). Michael Trucco has been cast as the lead in a new NBC comedy pilot. Tricia Helfer told Vancouver 24 Hours that she has a TV development deal for next season. Come in Major. I’ve been waiting for you for a long time. Entil2001 has posted some thought-provoking, in-depth analysis of RAZOR. Yes the ratings for RAZOR are out. They are not surprising. Also notable: the RAZOR unrated/extended DVD has been on Amazon’s Top 50 Best Sellers list for several weeks now. Livejournalist gdg found this nifty LocateTV widget that can tell you when all the new and rerun BSG eps are airing in your specific broadcast region. Daniel Schweiger in If Magazine reviews Bear McCreary's season 3 BSG soundtrack. 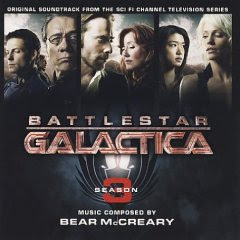 It’s fitting that Bear McCreary has used BATTLESTAR GALACTICA to reveal himself as one of the most innovative, and intriguing composers on tv. For few other, already-clichéd ’70s sci-fi shows seemed to promise further (if lovable) goofiness than this STAR WARS knock off. Yet no tv relic has ended up being so brilliant in its in-your-face revisionism, particularly as heard in its music. For what started off as the dull, beat-heavy music of Richard Gibb’s pilot would soon turn into something wondrous under McCreary’s stewardship. As the show found its footing, the its music opened up into a seemingly limitless galaxy of melodies, among them the dangerous percussion of space battle, ethnic melodies for the twelve colonies, and the ethereal atmospheres for the gods they worshiped. It was a religioso sound that made heroes and villains into one glorious enigma. The heavy orchestra you’d expect was out the airlock (at least until the second season), proving that this young composing Turk wasn’t John Williams – thank Kobol. And with every slow step that the Galactica took towards earth, Bear McCreary unveiled some new, melodic mystery that he doesn’t so much intend to solve as explore. That sense of discovery reached new heights in Season 3, where music seemed to carry the show more than ever before, especially in some episode’s knowing void of dialogue. The interior of the Cylon ships became a haunting, lone piano. Dark bluegrass embodied a recall of war crimes. An Indian Sitar became a space battle cry, and the unforgettable, and frankly insane of use of “All Along the Watchtower” rose Starbuck from the dead while revealing unlikely Cylons in Galactica’s midst. But old musical friends returned as well to re-affirm McCreary’s musical continuity, among them the bagpipe theme for Lee Adama and his stern father, as well as the lush, flowing string melody that announces a new generation of Cylons that prove them as more human than human. Slice of Sci-Fi picks up on various reports indicating that Katee Sackhoff won't be back on Bionic Woman. However, it's also most likely that Bionic Woman won't be back at all anyway, since the ratings have slipped so much. Is NBC shocked that people quit watching that crap? Katee was the only draw on that show anyway. And a fine actor like Miguel Ferrer was woefully underused. It seems like that show never knew what it was, and it felt like they had too many chefs, when all they needed was one good one. 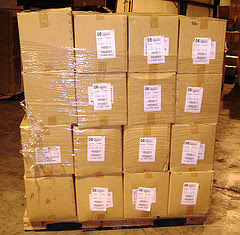 Here's what a pallet of Pencils to Media Moguls looks like. Keep sending pencils to keep the pressure on the studios to make a deal. I hope truckloads keep arriving. Another wonderful aspect of RAZOR, is that we finally get a new recap on Television Without Pity. Yay. This one is 26 pages. Enjoy. From Deadline Hollywood Daily, the latest negotiation news, and it's not good. Speecheless #15 "Just What's On The Page"
BSG YouTubers should get cracking on a similar video. Some data points on exactly how much money the writers are asking for. Deadline Hollywood promises a negotiations update here, but as of this moment the update hasn't arrived. Mark Verheiden has a weather report from the Barham Gate. This is what they are fighting for. Check this out from Ben Stein. Entertainment Weekly and The Seattle Post-Intelligencer review Razor, as does the Battlestar Galactica review blog. I am thrilled to give you a report on how today's much-anticipated resumed contract talks went between the writers and the producers. And they went well, according to my sources. "It was very productive, very level-headed, and it seemed as though the producers came ready to bargain," an insider told me tonight. "Reasonableness ruled the day." In fact, the AMPTP reps for the studios and networks showed up to the first day's negotiating session since the WGA strike began November 5th with what was described to me as "a very comprehensive proposal which laid out to all the entire roadmap to the deal. Over the course of the session, the producers addressed every single issue, and the writers listened and kept getting up to caucus." ..."So they basically went through all the proposals on the table: what they'd already agreed upon, and where they needed to go from here," an insider explained to me. "Tomorrow, they really start advancing the ball forward." To keep the pressure on the AMPTP keeping joining the writers on picket lines, send pencils and make those phone calls. For some Sci-Fi/Razor humor just click here. Trust me, if you watched Razor on the Sci-Fi Channel you'll enjoy this. Pencils are terrific...letters are awesome...and emails are effective too. But if you fans who support the WGA in their strike want to make the biggest impression on studio/network honchos, a personal phone call is always best. If any of you are interested in participating in the fan phone call blitz today and tomorrow, organized by livejournal community WGA_SUPPORTERS, please go read this. And note that down here in the comments, you will find info specific to calling the Sci Fi Channel, btw. Calling today during ongoing negotiations is not going to hurt the writers side. It will only help. "It's already done, basically," the insider describes. That's because of the weeks worth of groundwork by the Hollywood agents working the writers guild leadership on one side, and the studio and network moguls on the other. I was told not to expect an agreement this week. 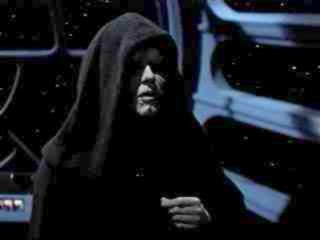 But my source thought it was possible that the strike could be settled before Christmas. Remember that many TV shows take a Christmas break anyway, so it shouldn't be too difficult for Battlestar Galactica production to get back up and running not long after the new year once scripts start being written again. The L.A. Times and New York Daily News have reviews of Razor. T.V. Guide had a preview by Michael Logan. Critic for the Newark Star-Ledger Alan Sepinwall shares his views on his blog. Bear McCreary writes about how he approached scoring the music for Razor, and how he developed a theme for Kendra Shaw that he used throughout the film. Be sure to check out the Battlestar Wiki entry for Razor. And for more insight into Admiral Cain and her leadership style read Maureen Ryan's Chicago Tribune interview with Michelle Forbes. Ryan: Cain has obviously been a very important figure in the ‘Battlestar’ universe. There was a huge response to her among fans, and I think that’s because, in some ways, there are things that are really admirable about her. She’s very dedicated. She’s smart. She doesn’t put herself first. Do you feel that’s the case, that she has good qualities? Forbes: I think that’s quite accurate. There’s always a sense in that universe that your time is about to be up. You have to prepare whatever future there is. Cain is always aware of her mortality and is quite willing to sacrifice her life and she expects the same of everyone around her. I’m a big fan of Cesar Millan [host of ‘The Dog Whisperer’], and he states on many occasions that by nature, dogs will follow a strong leader. They will not follow a weak energy, and that’s true of people as well. We want a strong energy to follow. We want someone who seems fearless. And that’s true of Cain. I think that there is something compelling and comforting about her sense of duty, and her sense of getting the job done at whatever cost. There is comfort in that in difficult times, in times of war. But people like that may be misguided. Between the trailer that Logan posted last week, and this new promo spot we saw last night, you can get a real feel for how many new scenes will be included on the RAZOR DVD. Meanwhile, the official RAZOR DVD site has some new (mildly spoilery) clips and cast interviews. If anyone can understand what the hybrid is saying in the clip called "Season 4 Sneak Peak," please leave a comment here. Wake up and smell the RAZOR. A new version of the Season 4 promo spot ran last night on SciFi. Same cut with some small differences - the biggest being the announcement of the season 4 premiere in March...if this is the real start date, one wonders if the rumored release date of the season 3 DVDs is really in April? Also, what is up with Starbuck and that gun? Hmmm. "I don't recall really turning to any particular historical figures as we've worked through the three Cain stories. I always looked at her as something of an anomaly, a woman caught in a unique moment that she then defined in terms of her own experience and her notions of how a commander should behave in a time of war. I always kept in mind the fact that Adama had seen war -- however briefly -- and Cain had not. The fact that she was relatively young for her rank also factored in for me and contributed to her tendency to take a hardline and stick with it, even past the breaking point, as when she shot her XO. With everyone aboard Pegasus thrown into the bewildering situation of potentially being the last members of the human race, it seemed like her willingness (or need) to take matters to frightening extremes could have then been plausibly embraced by the vast majority of the crew. …Cain determined at some point that the human race was doomed and the needs of the civilians were outweighed by the military imperative to strike back and inflict as much damage on the enemy as possible with every weapon in her arsenal and for as long as her ship survived. I don't think she ever really held out much hope of finding a way to survive as a race and therefore she had less interest in saving lives at that point than she did in fulfilling what she saw as her mission. It's interesting that people think of Cain as a negative character. She's really one of my favorites in the entire series." On the writers residuals from the RAZOR DVD sales: would it be better to wait and buy after the WGA strike is over? “The guy in the ooze was the first Cylon attempt at building a Hybrid. It was a special project that worked on ways to control the baseships more efficiently, as well as take another step toward understanding God. Inside the baseship are the results of the first experiments involving "evolving" the Cylons toward human form. Razor airs tonight on Sci-Fi. Here is ProgGrrl’s review of Razor, and my review posted previously. See BSG co-exec producer Mark Verheiden’s comments on Razor, on his blog. Tell us what you thought of Razor in the comments to this post. There's a site out there called Fans4Writers.com that was put together by -- you guessed it -- fans. It's a really great place for fans to go to find information about the strike and how they can help to support the WGA in our cause. They're already started doing things like creating their own postcards for fans to download and send to the studios, and of course, they are participating in the Pencils campaign instituted by the Guild. Everything's all set-up, they just need more fans to actually go there and participate. Once they're there, they can participate in bigger actions like potentially demonstrating at individual TV stations across the country (something under discussion on the site right now). Something we can do as showrunners is to go to our own boards and tell our fans to go to this site for information on what they can do to support us. We can also go to the forum they've set up and post messages in the threads they've created for our individual shows. Having us there, even only sporadically, will help drive traffic to their site and bring more of our fans to a place where they can help support the strike as we enter the next round of negotiations. Please take a minute to check out www.Fans4Writers.com and consider posting a message to your fans, we think it's worth the effort. Bill Hunt of The Digital Bits reviews the DVD extended version of Razor. I can't wait to see the extended version, it sounds really really good. Happy Thanksgiving from your friends at WKRP Galactica Sitrep. The New York Times has an article about Razor, and other shows besides Battlestar Galactica that have used DVD sales to their advantage. The episode, “Razor,” marks yet another step in the complex, fast-changing relationship between DVD sales and cable broadcast. The episode would not exist except for the promise of selling it on DVD just days after it is shown on television. The move is part of a trend. Already there have been instances of DVD sales reviving canceled television series, like Fox’s “Family Guy,” which sold so well that it was put back on the air. And “24,” also on Fox, began selling DVDs of its four-episode season premiere earlier this year, the day after it concluded. But such tactics are still rare. “You can’t strip them from all scheduling in a way that allows people to dip in and out,” Mr. Howe said. Sci Fi also took the unusual step, for a television show, of screening “Razor” in movie theaters in eight cities around the country this month. Mr. Howe said the screenings, sponsored by Microsoft, led to lines “around the block” at participating theaters, two of them in Manhattan. As with many television shows, production of the “Battlestar” series is hobbled by the writers’ strike. The first half of the forthcoming season is unaffected, Mr. Howe said, but the second half could be delayed. Sending pencils in support of your favorite striking shows & writers just got even simpler...just use the handy widget we've put up here at Sitrep on the righthand column. Meanwhile, if you prefer writing or calling your moguls - see BringTVBack's nifty list with phone numbers. Anyone who wants to support the many "below-the-line" crew who will be hit very hard in their pocketbooks by a prolonged strike, ie the rest of the show's staffs besides writers/directors/actors, can donate to The Actors' Fund. Pencils are mightier than the sword. It looks like the Pencils and phone calls to the corporations, networks, and studios are having an effect. So the offices of Big Media moguls have been inundated with calls from TV fans who've been posting and emailing and otherwise sharing the CEOs' phone numbers. The fans argue the writers' side of the strike and want the walkout settled quickly so it doesn't interrupt future episodes of CSI or Grey's Anatomy or, god forbid, Lost. And it's kinda working. I hear it's driving the bigwigs and their staffs crazy. Pictures from today's march on Hollywood Blvd. The New York Times wonders if the ABC deal on the new LOST webisodes might become a model for this sort of deal in Hollywood. As we BSG fans know, other such deals have not gone so well. "I actually have been thinking about what I would do in the (I believe unlikely) event that the show never came back. There is a full storyline for the rest of the season and ultimately, the finale and I'm not sure what I would do with all that information. There's a part of me that would want to sit on the story, lock it all up and then wait for the studio to come to its senses and try to finish the story in some shortened form -- a miniseries or TV movie or something. I could also see writing the end in a book or graphic novel. I also have the recorded sessions of the writers' room at the start of the season where we discussed the overview of the last arc and a more intensive session from the retreat this summer where we broke down the stories in more specific terms and I've thought about just posting those recordings in the event of cancellation so that people could at least hear what our plans were originally." 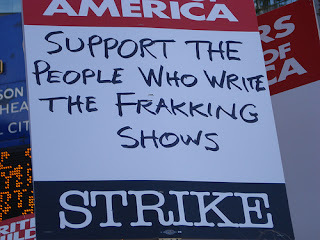 Reader Blake in Memphis, Tennessee: I have been wondering ever since the strike began what is going to happen with the shows we know for certain are in their last season, such as Scrubs, The Shield and Battlestar Galactica. I don't think I could take it if the strike ends up leaving some things from these shows unresolved for good. Kristin: The series finale of The Shield began production this week, so it will finish its complete run on FX. Battlestar Galactica is Sci Fi's crown jewel, so it's likely that no matter what happens, BSG will be permitted to finish its run. Scrubs, however, was already on thin ice with NBC, and Bill Lawrence has refused to pen a backup ending for the series. Meanwhile, The Los Angeles Times columnist Patrick Goldstein reiterates what internet guru Marc Andreessen put on the table earlier this week: THERE. ARE. OTHER. OPTIONS. Wired Magazine has a profile of Vancouver BSG fan club The 13th Colony and their tours of shooting locations around the city. Sometimes we have to do things that we never thought we were capable of, if only to show the enemy our will." --Admiral Helena Cain, "Battlestar Galactica: Razor"
Now there’s a statement worthy of debate. When does the will turn malignant? When do the actions that a person takes to survive make that individual no longer worthy of the title “human”? When do the ends no longer justify the means? Those are the questions that the reimagined “Battlestar Galactica” has asked for the past few years. And the genius of the series is that it asks these questions obliquely, without preaching or grandstanding. The solutions to these dilemmas aren’t easy, and the show doesn’t insult its audience by pretending that they are. Characters sometimes openly debate complicated, life-and-death issues, but more typically, the Big Questions are woven into the fabric of an absorbing, well-crafted character-driven drama. It’s nearly possible to ignore the moral dimension of the series – which is its most timely, bracing element – and focus on the rock ’em, sock ’em space battles, the energetic direction, the spectacular special effects and the deft relationship drama. Read Ryan's full review here. Monsters and Critics has an exclusive RAZOR clip up. Yahoo TV has a preview with cast interviews, discussing RAZOR and Season 4. Help write a new chapter in Hollywood history. Join thousands of members of the Writers Guild of America as the WGA begins week three of its strike against the media conglomerates of the AMPTP. March down Hollywood Boulevard with film and TV writers, actors, musicians, Teamsters, Service Employees and other unions in this fight for justice. More than 10,000 writers are on the front lines of the fight to preserve decent working standards against corporate power. 1:00 pm: Assemble at Hollywood Blvd. and Ivar Ave.
1:30 pm: March down Hollywood Blvd. A few interesting posts from United Hollywood on how the force majeure letters have backfired on the corporations and driven the writers and actors into stronger solidarity. It's important to remember that all the trade guilds benefit from residuals, not just writers, actors, and directors. And a ton of information on big media consolidation. Just so there’s no confusion, I’d like to make the distinctions clear between the two minute “featurettes” (or whatever we’re calling them these days) from “Razor” and last year’s “Resistance” webisodes that preceded the Season Three launch. I’ve given several interviews regarding the history of the webisodes and how the studio initially wanted to call them promotional material and not pay anyone, then finally relented on payment, only to refuse to provide credits in the end and forcing me to post them on my blog at SciFi.com. The distinction between the two is that webisodes were new material created specifically for the internet, while the featurettes are really little more than deleted scenes from “Razor.” In the first instance, we were being asked to write and produce new material without compensation or credit, while in the second we simply repurposed existing material that would otherwise end up on the cutting room floor. That’s not to say that the featurettes weren’t subject to a great deal of haggling and negotiation with the studio over issues of reuse and credits -- they were. But in the end, I agreed to go with the featurettes while still refusing to produce more webisodes because I felt that using existing scenes in this format was different than creating new stories. Hopefully, the new contract that gets hammered out between the studios and the writers’ guild will clear up all of this and provide enough clarity so that showrunners like myself won’t have to be in the position of making these calls on a case by case basis. Convention Reports from the BSG Convention in Burbank over the weekend are starting to show up. 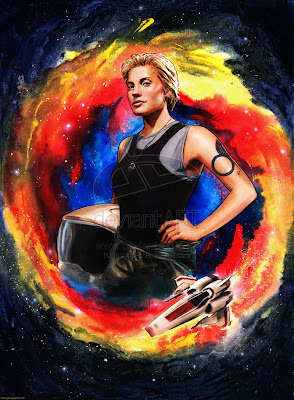 Roadrunner on Live Journal has a brief rundown with some spoilers from Katee Sackhoff at the very end of the write up. Also, Jamie Bamber talked to IGN and Boston Now about Razor and season 4. It's a sci-fi drug trafficked by diehard space-show junkies and mainstream viewers alike, and chances are someone you know is already hooked. It takes two words to separate the addicts from the innocent: Battlestar Galactica. The tipoff is a hungry look in their eye, the one that appears with a chance to debate the Cylon wars, and what they symbolize in the post-9/11 world. That's right, Battlestar Galactica. True, this is a “re-imagined” version of the original 1978 cheese fest, but can a remake of anything that starred Lorne Greene really be called one of the most important television shows of our time? You better believe it, baby...but don't look at me. I'm just a street-level dealer. “Battlestar Galactica” fans, rejoice! “Razor,” the special two-hour episode designed to tide you over until the fourth and final season of the dark and delicious science fiction series premieres early next year, may be the best one yet. Screenwriter (Field of Dreams, Sneakers) and Writers Guild of America, West board member Phil Alden Robinson recounts the turning points in Guild history and explains why the strike of 2007 is this generation of writers' watershed moment. From what I can glean, the casts of The Office, 30 Rock, Bionic Woman and Battlestar Galactica to name just a few shows on NBC and the SciFi Channels were informed Thursday and Friday that their contracts have been suspended. It's because Universal Media Studios has opted to exercise what's known as the force majeure clause in their Screen Actors Guild agreements. ...But regarding the striking writers, most of the showrunners and hyphenates who've walked off the job [such as Ron Moore] have been threatened with or actually suspended without pay for not fulfilling their producing duties. But the threats still hangs out there that the studios and networks could escalate matters by firing them. The conventional wisdom is that the studios and networks are purposely waiting for sufficient weeks to pass so that they can, in a first step to a major reorganization of their TV business, kill showrunner/hyphenate deals by invoking force majeure (a common contract clause that essentially frees both parties from liability or obligation when an extraordinary event, such as a strike, occurs). From that point on, all bets are off. Studios suspending actors without pay and not outright terminating their contracts, which prevents them from finding work elsewhere, has SAG pissed. Per SAG's agreement, studios can opt to suspend members for five weeks with half pay; suspend them with full pay; or release them from their contracts. Even if the actors are fired, they're supposed to be immediately rehired under their original contract terms once production recommences. I understand that NBC Universal mailed out a stack of these 'force majeure" letters which began arriving Friday at the agencies of various actors. One of the Battlestar Galactica thespians tells me: "When our agents and managers phoned business affairs for clarification, they were told that we are on suspension without pay. We are not terminated. We are on hold to BSG with no pay in perpetuity until the strike is over. When the strike does end Universal/Scifi will then decide whether they want to bring the show back or let us go. Until that time we are in first position with BSG and will have to clear any other project with Scifi/Uni. "They are not following article 61 of the SAG agreement and are about to get a lot of calls from SAG lawyers. They say that since we have shot the minimum 13 episodes of this season, as per our contracts, that they are under no obligation to pay us or let us go. We are essentially on hiatus. To say yesterday was a tough day on set as this information was slowly presented to us would be a profound understatement." But it appears the actors and their reps are planning to fight this idea of putting actors on indeterminate hold without pay under a "too bad we own you" power play. Regarding BSG, NBC Uni's SciFi channel is being told that, since the terms of Article 61 appear to be breached, the actors can terminate their deals and attempt to find work elsewhere. I smell a brawl brewing. Production wrapped on episode 413 late last night, and there’s no certain date to resume shooting. No more scripts exist. My office staff has been laid off. My cast has been suspended, without pay. I refuse to believe that we won’t finish, that we won’t be back to film our final stories, but I know and accept there is that possibility. The strike will be a seminal event for many of us in this business as it’s put literally everything we care about in the balance (if only for a short time so far) for something we all believe is important. Writers talk a lot about the strike, about the reasons we’re out on the picket lines and our feelings and experiences in the business. It’s been an interesting three weeks. I’ve connected with more scribes in the last few weeks than in many months before and I come away from it to date with a sense of optimism about the solidarity of the membership and admiration for my peers. Galactica’s coming back, I frakking promise you that. But I am ready to put the rest of the story on the table and take the risk that I’ll never be able to tell it, in support of this strike. Like Adama says, you make your choices and then you live with them. Mighty interesting how Doral put in all that effort to insure Lee was present for the Galactica's decomissioning ceremony, eh? Next stop is RAZOR on Saturday night the 24th - strap yourselves in folks! The AMPTP and the WGA have agreed to return to the negotiating table Monday November 26th, after the Thanksgiving holiday. The effort and energy and resolve of the strike captains and teams, on the line, in headquarters, on location, and out in the community including the blogosphere has had a tremendous impact, and been instrumental in bringing the companies back to the bargaining table. Congratulations! Of course, going back to the table is an important step; but we must not allow our effort and creativity to wane. The strike must continue and we must continue to increase our impact and message to get the best possible deal for writers and for others who will benefit from our struggle, including actors, directors, drivers, crew, etc. Jane Espenson posted this update about today's fan day at Universal. And if you want to send pencils to the moguls United Hollywood has organized it in a very simple and effective way, much like the "nuts" campaign that worked for Jericho. Just click here, and send some pencils. Speculations: The show runners like Ron Moore and Carlton Cuse said they would return to their producing duties on their shows if the AMPTP returned to negotiate in good faith. With negotiations set for the 26th, are the show runners returning to work? Lets hope so, so that these two sides work out a fair and proper contract. Maureen Ryan has an interview with writer/producer Michael Taylor, in which he also answers fan questions (including all of mine *joy*). Please note per Maureen: the interview "contains spoilers (though in my opinion, Taylor did a good job of giving us vague yet tantalizing clues and not too many facts or plot points about 'Razor' and Season 4)." I've been asked to pass along the information that the fans of the new show LIFE will also be congregating at Universal tomorrow -- at gate 5, also one of the gates along Lankershim Blvd. Really, if you're a fan of anything, I think it's safe to say that you'll have a good time and we'll certainly be glad you're there! Also, another update on what we Battlestar writers will be doing -- I'm told now that we will be picketing starting at TEN, not nine, and that the rally itself will start at eleven. Just come on by... that's all it really boils down to. 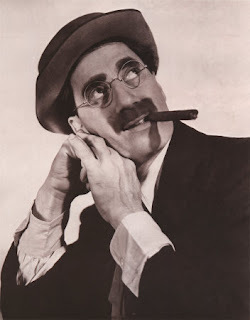 Irv Brecher is a writer who wrote for Groucho... which allows me to confirm that my pro labor position comes from being a Marxist... in the brotherly sense. There had been some reports that John Edwards would be showing up at Universal on Lankershim, but it now seems clear he will be at NBC in Burbank. Visit Fans4Writers for more info. UPDATE, Fans4Writers reports that the BSG writers and fans will be gathering at Universal's Main Gate. (Which is even closer to the MTA station I linked a map to in a post below.) And Mark Verheiden posts this update. Maureen Ryan has a full roundup of strike news, and humorous videos by writers on strike. For some background on some of the other issues in new media, internet downloads with iTunes, vs. streaming ad supported sites like NBC's Hulu, visit here and here. As mentioned before...the music biz is ahead of the film/TV biz in this area. Maureen Ryan reports on the vast public support the WGA has in this strike with the corporations. The WGA has released a statement thanking the public for supporting them. If you're planning to join the BSG writers at Universal on Friday, I would suggest people consider taking the MTA Red Line. Universal City station deposits you right in front of Universal, and it's just a short walk over to Gate 2 where the BSG writers will be. Map. Map. Google Map. Jane Espenson and Mark Verheiden have further updates on the Fan Day. In some fun non-strike news, we had a special private screening of the DVD version of RAZOR, the upcoming BSG film, this evening. It was a stunning high def presentation, a total knock-out. The TV version is great, but the uncut DVD version is really something. Coming VERY soon to DVD stores near you! As of now, there is no OFFICIAL fan day for anyone. But we know that the BSG fans have been organizing around the convention. Hence the delightful reference in this mornings WASHINGTON POST (for god's sakes) about the 3000 costumed cultists. Anyway, here's what we have so far. Yes it's true folks: Ron Moore has begun a new, non-NBC/Universal-owned blog to discuss the strike and whatnot. 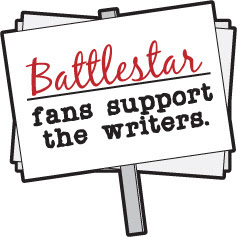 Terry Moore has opened a few threads on Fans4Writers.com to for all BATTLESTAR Ron Moore fans to discuss their support of writers, the Fan Day this Friday on the WGAW picket line, and general strike info. Get yer butts over there! Also, have you heard about this idea to send (mercifully unsharpened) pencils to the moguls? Of all the fan movements, this one seems to be the one that's catching fire. I like it! If I hear more about it, I'll let you know. Blog Critics and Blogger News have reviews of Bear McCreary's season 3 soundtrack. The breakout performance in Razor is turned in by Stephanie Chaves-Jacobsen, as officer Kendra Shaw, who gives this feature-length story its grounding despite her character's innate rootlessness. Shaw is the sharp instrument of the movie's title, and her haunted actions and harrowed eyes speak to a hellish life in a military machine that leads a civilization forever on the run from a deadly menace of its own creation. I should have definitive times and places for the big "fan day" gathering this Friday very soon, it's still being figured and plotted and planned, but if you pencil in 11:30AM to 1:00 or 2:00 PM, you'll probably be in good shape. But we hear rumors as well: that the conglomerates are the ones doing the threatening, both privately and openly. There are rumors that network executives have told showrunners that if any of their writers are seen speaking up during the strike, they expect them to be fired when the strike is over. We all know showrunners are being threatened with lawsuits for respecting the picket lines. And there's another rumor that one showrunner in particular has been told that the AMPTP is going to use him as "an example," that they're planning to sue him and then see that he doesn't work again. Gosh, that sounds kinda like... blacklisting. It was the third time I’ve watched “Razor,” and it was the most satisfying. The film-quality direction, production values and special effects of “Battlestar Galactica” really become apparent when you see the show on the big screen. The action sequences and battles of "Razor" were even better and more impressive in a movie theater. (One complaint: The sound was a little too low during the screening I attended.) 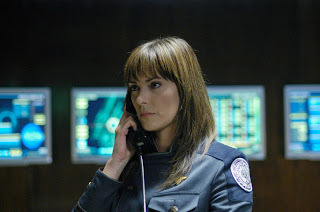 ...Next week, I’ll post my interview/feature on “Razor,” which will include an interview with Michelle Forbes, who stars in the film as Admiral Helena Cain. I’ll also post the Q&A with [Razor writer Michael] Taylor next week. Also Josh Tyler reviewed the telefilm for Cinema Blend giving it 3 stars. 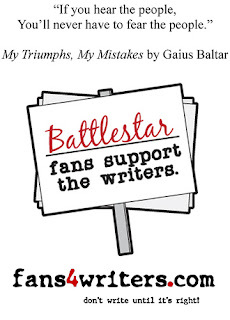 Fans have been posting their experiences and reactions to the screening at the Battlestar Blog on Live Journal. If you went to a screening tell us about it in comments to this post. Vancouver fansite The 13th Colony reports that an outdoor set of ruins for Battlestar Galactica was heavily damaged recently when a fierce windstorm rolled through British Columbia. Repairs will be made to continue using the set for shooting. You can see photos (spoilery) at the flickr site of quite_contrary. 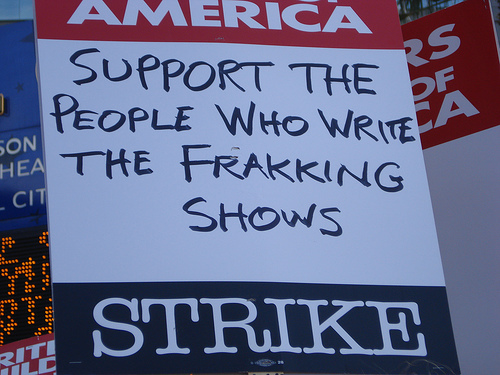 On November 13th, this blog and the blogs listed below will be on strike for the day in solidarity with the Writers Guild of America. As fellow writers and as TV fans, we are coming together to express our strong support for the writers and their goals. We believe that when a writer's work makes money for a company, that writer deserves to be paid. Many writers depend on residuals for a stable income, and that income shouldn't be based on an outdated formula which ignores the existence of new media and all but a tiny percentage of DVD sales. The talented writers responsible for so much of what we love about television should and must be paid fairly and equitably, and we will stand with them until they reach that goal. For everyone's sake, and for the sake of television, we hope both sides can come to an agreement quickly. After the blackout, we intend to continue our campaign to support the WGA until the dispute has been resolved fairly. Since we will not be posting any new content on the 13th, we encourage our readers to visit United Hollywood instead for frequent updates about the strike. Also, here's a novel idea about sending pencils to the AMPTP just like the "nuts" campaign that saved Jericho. And the author of Nickeled and Dimed writes in The Nation about the writer's strike. And The WGA has put out a list of the stars that will be joining the picket lines on Tuesday at Universal's main gates on Lankershim. However Jane Espenson reports that the Battlestar writers are being moved back to the Barham gate. We'll be back on Wednesday, with all the latest BSG news. This reviewer and I obviously don't see eye to eye...although I'll go with his description of BSG as "the Sylvia Plath of science fiction." OK, yes: it's a rumor, that all 3000 attendees of the Creation BSG Con will converge on the WGA picket line at Universal. That is not the case. HOWEVER it most certainly IS TRUE, that BSG fans - and heck, all TV fans period - in the area are cordially invited to join the striking writers at Universal Studios on Friday, November 16th. Come on down! I believe Mr. Verheiden will keep you posted on the time/location...or just refer to the WGA's picket locations page. In Silicon Valley, there are many companies, large and small, that create, market, and distribute products -- and more such companies all the time. In fact, there is a whole industry -- the venture capital industry -- devoted to creating as many new such companies as possible, as rapidly as possible. In Silicon Valley, creation, marketing, and distribution of a compelling new product is not very expensive. And with the Internet, marketing and distribution costs drop nearly to zero. Most successful Internet companies, large and small, use free viral marketing techniques and never run ads. And the whole concept of distribution costs goes away when everything is digital -- the next set of bits costs nothing to manufacture. Therefore, there are no bottlenecks. Many companies, large and small, can afford to be in business -- can afford to develop new products and bring them to market, market them and distribute them. And nobody can really block you. In Silicon Valley, the creators of the product -- the talent -- are owners: owners of their product, and owners of their company. In fact, the entities that finance the companies -- venture capitalists, private equity funds, the public stock market -- want the creators to be owners: in a world where there can be many companies, the best creative talent will be drawn to the situations in which they will be owners, and will be compensated as owners. Because of that, in technology, creators get paid like owners. Therefore, there are no unions. There is no reason for the creators to unionize -- they would be negotiating with themselves. The concept of residuals does not exist -- they'd be paying themselves. And alignment of interests between creators and financiers is near-perfect. There is also the music business to consider...plenty of musicians have figured out ways to make the internet work for them. Wouldn't it be nifty if film & TV artists could do the same?